Air conditioning is key to many people’s comfort and health during hot San Diego summer months. 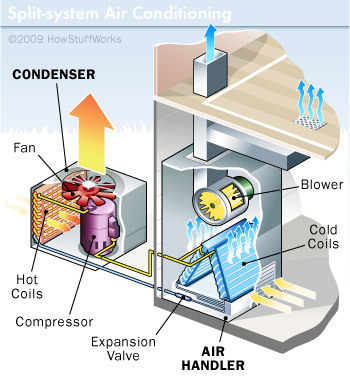 Yet for all its popularity, do you know how your air conditioner works? Let’s take a look inside the ubiquitous machine. Fans direct hot indoor air over evaporator coils filled with cool, liquid refrigerant. The liquid inside absorbs heat from the air and is converted into a gas. Having absorbed some heat from the air, the refrigerant is now a fairly cool, low-pressure gas. This gas is directed into the compressor, where it is squeezed to raise the gas’s energy and temperature. Now a hot, high-pressure gas, the refrigerant enters the condenser. Metal fins on the condenser dissipate the heat contained in the refrigerant into the environment outside the house. The refrigerant is returned to a cool liquid state and enters the evaporator to begin the process again until your desired indoor temperature is reached. If your air conditioning system isn’t functioning properly, you could have an issue in any one of these areas. Give Precision Temperature a call at 619.588.5321 for quick and reliable diagnosis of any heating, ventilation, and air conditioning (HVAC) problems today, or take advantage of our Maintenance Agreement to catch any potential problems before they start!